I am so happy that my tree is thriving and doing well. I had some concerns when it came delivered because it looked as if there was no life to it at all, but it is thriving and doing well! The Silver Maple Tree gets its name from the silver coloring on the bottom of its leaves. The top part of the leaves are green in color. These trees are deciduous and broad-leafed, and can grow to a mature height of 70 feet tall and 30 feet wide. In ten years, the tree can grow to a height of 26 feet. 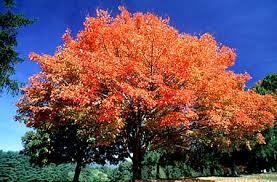 The Silver Maple Tree needs full access to the sun in order to grow, but it can thrive in poor soil conditions. The tree is best suited for Climate Zones 3 to 9. Silver Maple has the most abundant winged seeds of any indigenous maple species. Their attraction to birds and other wildlife make this tree a popular choice for many a garden. Its leaves are lush green in spring and summer and take on bright autumn colors during fall. The name Silver Maple refers to the silver hue of its smooth trunk and branches. These trees are easily grown in all types of soils as they can adapt to any conditions. They are also great because they can live in drought conditions. They provide beautiful coloration and adds lots of life to a lawn or other landscape where they are planted. These trees are magnificent choices for landscaping projects as they are so easy to grow and maintain. They also grow to be very strong and durable and can withstand harsh weather conditions. They make outstanding shade trees to enjoy during the hot and humid months of spring and summer as they are covered in rich green leaves. These are an excellent choice and are shipped to customers in their bare root form and are very easy to plant and get established into soil conditions. Silver Maple Trees add lots of excellent and much-needed curb appeal to all landscapes and home lawns.